Now, I’ve criticised the Green Party before for basing their policies on ideology rather than on sound science. I’ve also criticised journalists who should know better for swallowing outlandish fear-mongering about EMF without a hint of skepticism. Now all the threads are coming together. 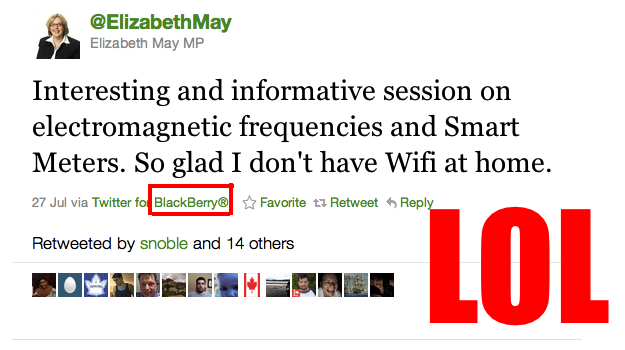 Elizabeth May, the leader of Canada’s Green Party and the first Green candidate to be elected to federal office, recently took to Twitter to criticise BC Hydro’s Smart Meters, pausing only to take a swipe at WiFi in schools. For a politician to be frightened of a tiny, low-voltage device that generates a shadow of nature’s everyday state, at a natural frequency, betrays an unacceptable level of disdain for basic science and knowledge of nature. There are reasons that we chose radio as a means for delivering information. It’s natural, it’s easy, and it’s the way our environment works. One can try to argue that radio is used because it’s cheap and profits can be easily made, with a reckless disregard for health, but claims of health effects rapidly disintegrate under even the simplest of scientific scrutiny. To give a quick summary, there is no convincing data to link cell phone use and brain cancer. Epidemiological studies have not found an increase in the incidence of brain cancer following the widespread adoption of cell phones in the mid 1990s – as one would expect if there were a causal relationship. Further, large scale studies have not found any consistent correlation between cell phone use and brain cancer. Tips o’ the hat to Eric Davies and Tim Herd. 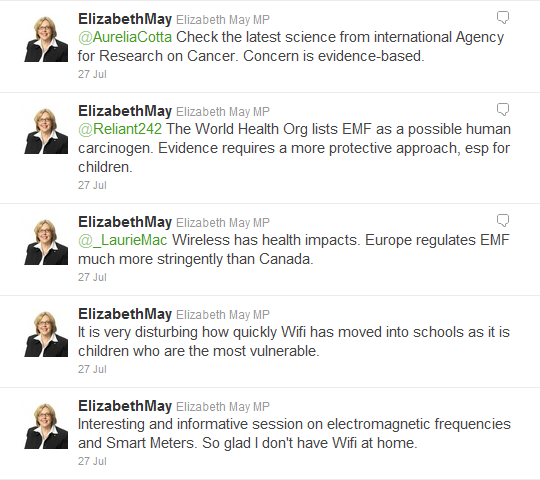 For the record, U.S. Greens have not signed onto any health concerns about EMF. It’s clearly a minority opinion in the south. 1.0 out of 5 stars Want organic cat food? Want a relaly satisfying organic cat food?Try teaching your cat to get off its dusty [….] and try catching a mouse now and then. Old Lizzie doesn’t take kindly to being de-elected either and had the rules changed to suit her, as I recall. If she says it, its right to her. Nothing surprises me about her. Fighting her with facts and science is futile because of her position. As leader of the Green Party, she is infallible to the proles because she is the leader of the Green Party. Maybe I should mention that Green opposition to “smart meters” in the U.S. is mainly based on the fact that they cannot be audited by the customer. It’s a question of accountability. Add to that, having more radio frequency stuff in the air is likely to interfere with other radio frequency stuff that you might prefer. Well, I certainly can’t find fault with either of those points.